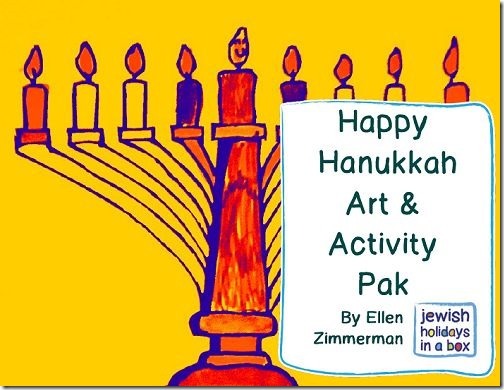 If you are looking for something for your children to do this Hanukkah, the Happy Hanukkah Art & Activity Pak is a good place to start. It’s one of the many products available from Jewish Holidays in a Box, a company started by Ellen. She enjoyed celebrating the Jewish holidays with homemade decorations and fun activities when her children were little and now she wants to share the joy with others. The Happy Hanukkah Activity Pak is a downloadable product but there are physical products you can order from Amazon.com as well as a few other downloadable products. Happy Hanukkah Banner (letters for the banner that can be printed and coloured/decorated and then tape up or strung up to make a banner. The book is 28 pages total including intro, bio and info on other products sold. If you know your way around a computer you might be able to produce the activities yourself but for a great price of $5.77 you can save yourself the trouble and get it all together in one package. PLUS, I have a special code for 40% off so you can get the kit for only $3.46. Use PROMO CODE callista at checkout. There is also an e-book for Passover and Shabbat and other products are in the works for Purim, Sukkot and Rosh Hashanah. Thanks to Ellen I am giving away the Hanukkah Triple Play (RV: $15.95) to one person ANYWHERE in the world. NOTE: All prizes will be digital. You will not receive an actual book or CD but a digital copy of the materials. Other Winners email will be shared with the company for fulfillment of prizes. See full terms & conditions on rafflecopter form.